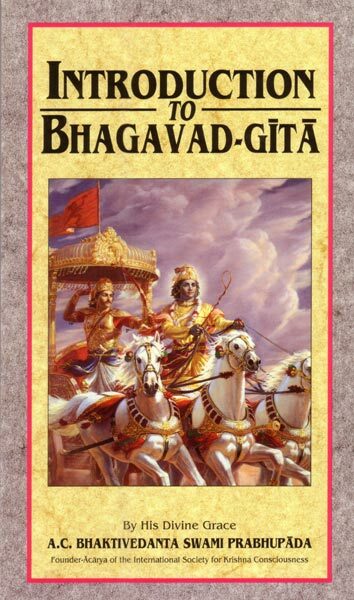 Introduction to Bhagavad-gita is a valuable companion to any edition of the Bhagavad-gita; Srila Prabhupada wrote it in 1968 as his introduction to Bhagavad-gita As It Is—before he even knew if he'd be able to publish the entire Gita—and included within it the essence of all the Gita's teachings. He begins the Introduction by advocating "submissive aural reception" as the proper mood for being able to understand the Bhagavad-gita at all. If we think the Gita is just another book, he says, we're missing the point; its speaker, Krishna, is the Supreme Person Himself, and those who accept Him as such can get incalculable benefit from hearing His words. Introduction to Bhagavad-gita concisely explains all the Gita's major themes, such as the difference between the self and the material body, how to prepare to leave the body at death, how our eternal dharma/nature/duty differs from what's known as "religion," the distinction between God and ourselves, how the personal feature of the Supreme is superior to the impersonal conception of God, and much more. This is one book introduction that's every bit as useful as the book it was intended to introduce. The Bhagavad-gita is the greatest of India's ancient spiritual classics. Srila Prabhupada, the Founder–Acharya of the Intennational Society for Krishna Consciousness, originally translated the Bhagavad-gita in 1967, proving each verse with an illuminating commentary. Having only recently come to the West, he was unable to print the book at that time. Therefore, the introduction which he had written for the Bhagavad-gita was printed first as a separate pamphlet. This booklet is a reprint of that introduction. The reader will find in in a thorough exposition of the philosophy of the Bhagavad-gita in a clear and straightforward manner. This introduction is important for those who are approaching the Bhagavad-gita for the first time. Unlike other presentations and translations, Srila Prabhupada presents the Bhagavad-gita as it is, free from personal speculations and interpretations. He focuses our attention on what Krishna is actually teaching in the Gita. For all these reasons we are sure you will find this introduction to the Bhagavad-gita to be enlightening and conducive to personal transformation. Bhagavad-gita was originally spoken to liberate one from the bodily conception of life, and Arjuna put himself in this position in order to receive this information from the Lord. One must become free from the bodily conception of life; that is the preliminary activity for the transcendentalist. One who wants to become free, who wants to become liberated, must first of all learn that he is not this material body. Mukti, or liberation, means freedom from material consciousness.